In this brief segment, Professor Mormino describes how America’s love affair with the automobile contributed to Florida’s growth in the Fifties. Those of a certain age can probably recall the mystical sounding names and exotic reptiles from the pop culture of their youth. Jack Davis, a Florida environmental historian, echoes and elaborates on the theme, positing that a synergy between the automobile and air conditioning shaped the nature of that post-WWII growth. 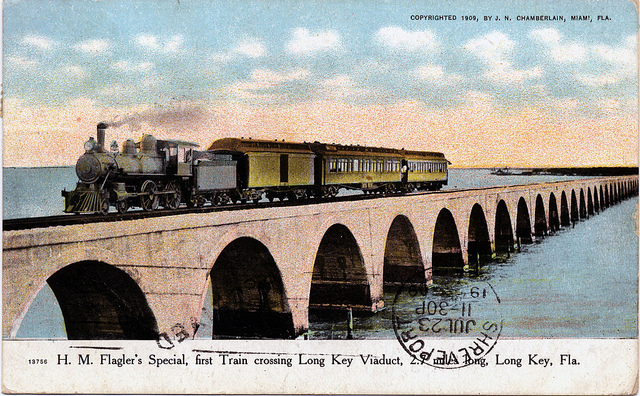 H.M. Flagler’s Special, first train to cross Long Key Viaduct. Before we loved cars, though, we loved trains – and it was the Florida East Coast Railway which led to the first great wave of growth in Florida. 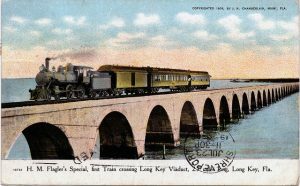 Henry Flagler has not been immortalized in pop culture but he bulit a railroad all the way to Key West and punctuated it with hotels, establishing the tourism and agriculture industries in the process.